Remember how the reliever market was so robust this offseason that a cost-conscious team like the Cubs could theoretically sit out the first and second and maybe third waves of signings to pick over the scraps at the end of the offseason to get the guys they like the best of the rest on cheapo deals? As we discussed this morning within the context of Brandon Morrow’s surgery and rehab, the Cubs just can’t afford not to add at least to the depth of their bullpen options. Sure, the front office might say they like their internal group, but there’s no chance they don’t recognize the significant downside risks. The money might be tight and the trade options slim, so the front office isn’t about to go out there and lose what precious little leverage they have. 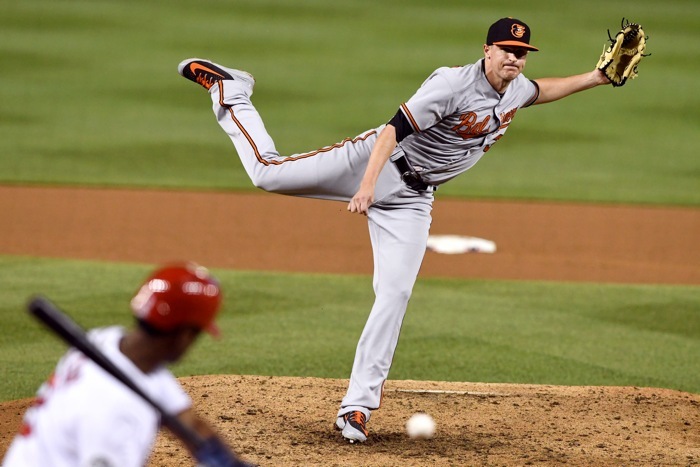 Brad Brach, RHP, 32 – A formerly very good later-inning reliever with the Orioles, Brach came up in rumors last year as a potential trade target for the Cubs. Although he was *excellent* in 2015 and 2016, he’s regressed to merely “OK, fine, passable” the last couple years. Concerningly, every peripheral you’d want to monitor took a big step back for him last year with the exception of his groundball rate, which is not elite in any case (46.0%). The results were still pretty good (his 3.59 ERA was about 16% better than league average), but you just worry about the trends as he heads toward his mid-30s. Worth a shot in your bullpen at a low cost? Sure. More than that? Don’t bank your offseason on it. There are still quite a few relievers out there on whom you’d happily take a one-year, cheap roll of the dice (or maybe even land on a minor league deal with a big league split salary). Let’s see if one of them falls to the Cubs.